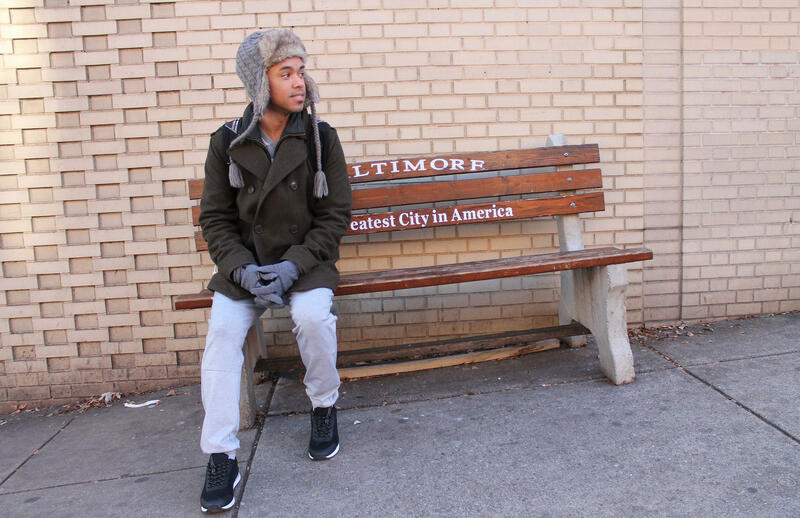 Waiting at a downtown Baltimore bus stop. “I wouldn’t give them my phone so they sucker punched me and made me put it my passcode and made me reset it really quickly and they left,” Jake said. 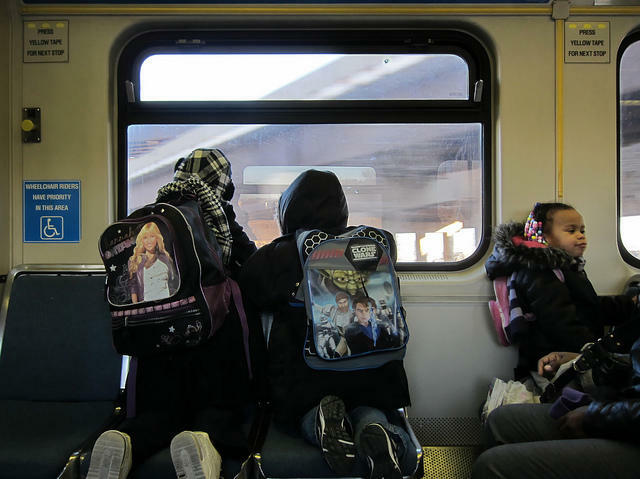 Police quickly responded, picking up Naquin and his friend, but the increase in after-school robberies at public bus stops has left some students fearful of their commutes. “We’ve been dealing with this issue of these kids robbing kids for cell phones for the last 4 or 5 years but now it just seems like it’s happening more, “ said Akil Hamm, acting chief of Baltimore City Schools Police. He says most of the crime is happening at bus stops especially in Northeast Baltimore where kids congregate. Often it’s teenagers in small groups stealing cell phones. Now Baltimore City Police, city school police and MTA police—have launched efforts to reduce these crimes. But Hamm says it’s often difficult to monitor and separate horseplay from crime, particularly with so many students – scores sometimes – waiting at the stops. John Land, city schools’ executive director of operations, said school officials are making changes to improve safety. When crimes spike, there’s a detail involving school, Maryland Transit Administration and city police. Officers work specific corners and even walk onto the bus to talk to kids and ask them about safety issues. “On a day to day basis – all three –school police, city police, school police, and MTA police are in communication at dismissals,” said Land. The MTA, which operates city buses, keeps its own data. The school police keep track of what’s reported to them. City police have crime statistics that don’t track assaults or robberies of children by bus stop or bus lines, though they have breakdowns of crimes by time of day and they log robberies committed by juveniles. These three agencies hold monthly meetings with the State’s Attorney to track hot spots and identify repeat offenders. Chief Hamm says school police use those numbers. In addition, school police are asking parents to report incidents to principals so they can keep better track. Jake Naquin’s mother, Bernadette Naquin, doesn’t know what the solution is but she thinks because city schools are offering school choice, and require students to use public buses they must play a role. There’s a yearly survey students, parents and school staff fill out, but it asks a single question about safety getting to and from school that respondents answer by rating their satisfaction level. Naquin says for the number of kids she knows who’ve been robbed getting to or from school, she’d like to more clearly understand the roles and responsibilities of MTA, city schools, school police and Baltimore City police in making sure all children can get to school without fearing for their safety. As we heard Wednesday in the first part of this series, thousands of Baltimore City eighth and fifth graders found out last week whether they got into the high school they hoped to attend, or whether they’re going somewhere else next year. Jonna McKone looks at school choice is working for families in disadvantaged neighborhoods. 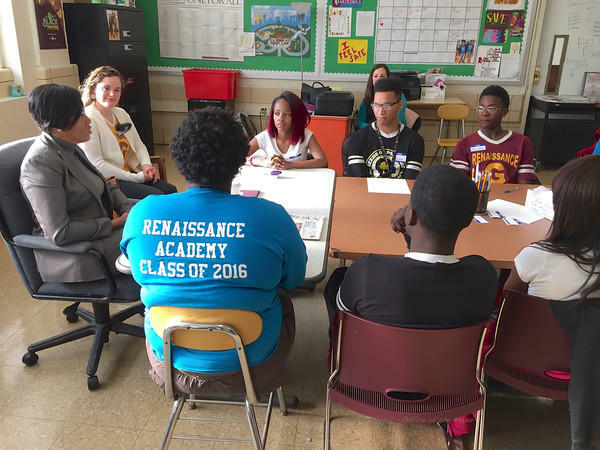 Renaissance Academy, a high school of just over 300 students, occupies an old brick building in West Baltimore’s Upton neighborhood. It’s a community school, where students and their families can tap into everything from a food pantry to college course offerings to free hygiene products.